How to Easily Master Format MICROSOFT LUMIA 650 with Safety Hard Reset? Tips and solutions for fix MICROSOFT LUMIA 650 problems with simple tricks. This phone is other alternative for cheap Windows Phone 10 smartphone with 5 inches LCD screen width and have options to use single simcard or dual simcard GSM-GSM that can work together, the dual sim also known as MICROSOFT LUMIA 650 DUAL. Do not worry if we want to have faster broadband network, because MICROSOFT LUMIA 650 already have 4G LTE network ready. We can play HD video at 5 inches screen at MICROSOFT LUMIA 650, because it have 720p screen resolutions. Like other previous product, this phone is not use Nokia Lumia 650 brand anymore, but officially call by Microsoft Lumia 650. How to Fix or Problem Solving for Recovery MICROSOFT LUMIA 650 hang or not responding or malfunctions or stuck or freezing or bricked ? What are the interesting features at MICROSOFT LUMIA 650? First it have 5 inches LCD screen size with HD resolutions, second is the cheap selling price, and the other interesting features is use Microsoft Windows 10 operating system. The operating system is ready to use because it is already installed inside 16 GB ROM or internal memory, therefore we will net get fully 16 GB free internal memory capacity. But we still have many free capacity to install many applications from Windows store like Whatsapp or Facebook or Twitter or Instagram or Line Messenger or Blackberry Messenger and many more. But sometime some applications can become trouble and make MICROSOFT LUMIA 650 hang or stuck or bricks or bootloop, especially when we install some bad or malware or viruses applications from non official Microsoft Windows Store. We need to force shutdown or force restart or reboot to clean temporary files and caches. If the problems still happen, then we have to do hard reset or master format. But please remember to make sure all data will be backup at safety place before doing hard reset, because all important data will be wipe or remove after doing hard reset or reformat. How to Force Shutdown or Force Soft Reset or Force Reboot or Force Restart MICROSOFT LUMIA 650 ? After use several period with many installation applications from Windows Store, then maybe our MICROSOFT LUMIA 650 can become hang or stuck or LCD touch screen not responsive with our finger touch, then we need to force reboot or force shutdown to clean temporary files and caches, also restart all running applications. The easy way to force shutdown MICROSOFT LUMIA 650 is by open back cover case, then unplug or remove the battery, wait about 5 seconds then put again that battery at the right positions, then continue press POWER button to turn on MICROSOFT LUMIA 650 again. This steps or soft reset or reboot will not remove any important data. When our MICROSOFT LUMIA 650 still work normally, we still can force shutdown or restart all running applications by press and hold POWER button until the LCD screen show ‘slide down to power off’‘, do slide the icon at this phone then MICROSOFT LUMIA 650 will turn off. We need to press Power button again to turn on this phone. How to Master Reset MICROSOFT LUMIA 650 to Factory Default ? The MICROSOFT LUMIA 650 will do the hard reset format, wait about three until five minutes. While waiting you will see the gear appear until it finish. When is the best time to reformat MICROSOFT LUMIA 650 operating system? Actually we do not need to reformat Microsoft Windows 10 operating system at MICROSOFT LUMIA 650, because that OS already installed when the first time we use this phone. But if we have many applications, sometime it can become crash and make the operating system damage or corrupt, our MICROSOFT LUMIA 650 will act not normal or can not response anything. At this time we need to reformat with factory default. First we have to know that clean factory default Windows Phone 10 operating system file source already saved safely inside MICROSOFT LUMIA 650 ROM or internal memory, therefore we do not need to copy or connect with other device. Just follow simple steps to hard reset above, then clean factory default Microsoft Windows 10 operating system will be reinstall automatically. But please make sure the battery is not empty when we want to reformat it. How to Scan Viruses or Malware at MICROSOFT LUMIA 650? As long as we use only official Microsoft Windows Store for download all applications, then MICROSOFT LUMIA 650 will not get any viruses, because all applications which is publish by developer will be check first before publish at Windows Store, therefore MICROSOFT LUMIA 650 will be safe from viruses or malware and does not need to install any antivirus applications. How to Unlock or Fix or Bypass or Solutions for MICROSOFT LUMIA 650 forgot password code or security lock screen or pin (lost password)? This phone can be use for business smartphone, it can keep many important data and also history of life with 8 megapixel main camera and 5 megapixel selfie front camera. Therefore we have to give security protections at MICROSOFT LUMIA 650. But what should we do when we forgot the password or pin answer of MICROSOFT LUMIA 650 screen protections? Unfortunately we can not do anything to recover, because Microsoft try to give good and safe security protections. Therefore if we forgot MICROSOFT LUMIA 650 security protections answer, then we have to do hard reset or master format using hardware button combination key like steps at #option 2 above. How to Improve Performance MICROSOFT LUMIA 650 to make run more faster? Contana is already build in at MICROSOFT LUMIA 650 and can run without problems for use everyday. This phone use fast 64 bit Quad-core 1.3 GHz Cortex-A7 processor from Qualcomm Snapdragon 212 with dedicated GPU (graphic processor unit) Adreno 304 for playing 3D HD games without lag. The memory management of MICROSOFT LUMIA 650 also good, therefore 1 GB RAM will sufficient to run several multitasking applications. But please remember that some applications maybe will not run normally and use processor resources and RAM very much, it will make MICROSOFT LUMIA 650 resources and RAM become insufficient and make this phone become slowly. Therefore we have to uninstall bad or not use applications. If we want to make our MICROSOFT LUMIA 650 back to faster again like new, then please consider to do hard reset or master format. Please note, MICROSOFT LUMIA 650 is not able to run Continuum for make this phone become PC like using external monitor and keyboard mouse, because the limited specifications resources. 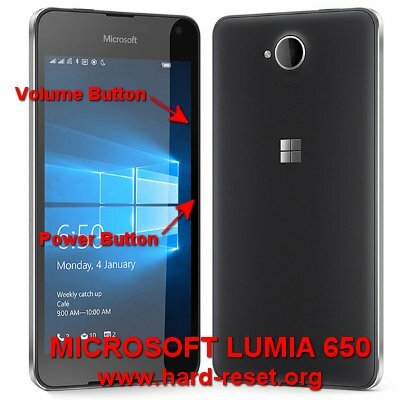 What is the Secret Code Key for Hard Reset MICROSOFT LUMIA 650 ? There is no secret code for doing hard reset or master format MICROSOFT LUMIA 650. Just follow the step above to hard reset is the easy way to do. The information from this page describe about factory reset microsoft lumia 650,microsoft lumia 650 problems,microsoft lumia 650 factory reset,microsoft lumia 650 bootloop,microsoft 650 hard reset key,lumia 650 hard reset not working,if the microsoft phone can not be reseted what to do,how to reformat microsoft lumia 650,hard reset lumia 650,nokia lumia 650 reboot option. If you need another resource for hard reset, use search function at this homepage or find from our related posts.